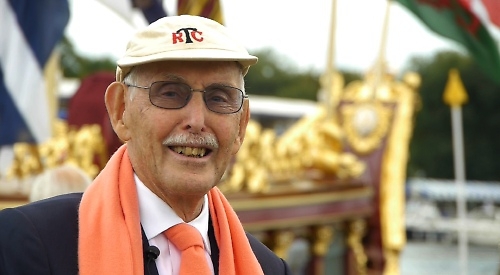 At the age of 82, Dr Charles Eugster was elected to Leander Club for services to rowing. He is here seen in his Leander tie and scarf and Thames RC cap. In the background is the Queen’s Row Barge, Gloriana. Photo: The Henley Standard. 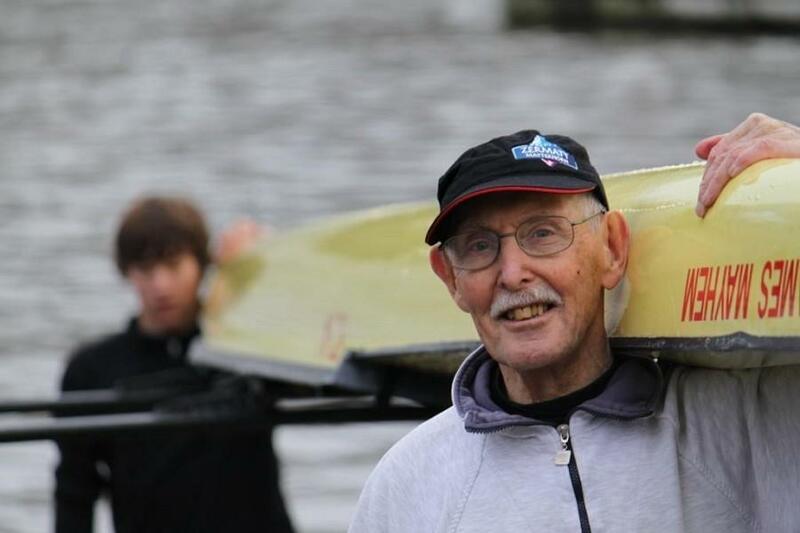 Dr Charles Eugster, the world’s oldest competitive rower, died on 26 April after suffering heart failure. He was 97. It is never, never too late to start exercising and rowing even as a competitor. Eugster, who was born on 26 July 1919, restarted a career in rowing at age 63, took up body building at 87 and sprinting at 95. When he died, he had the British records for 60m Indoor, 100m outdoor, 200m Outdoor and Long Jump and was a two-time World Record holder for his age group in sprinting and four-time World Fitness Champion. During his career as a master rower, Eugster won an incredible 40 Gold Medals for World Masters Rowing. After his studies at a university in London, he joined the Swiss Army – his parents were Swiss-German – but then spent his whole working life as a dentist. Building his dental practice and raising a family, there was less time to exercise. But then something happened when he was 63. 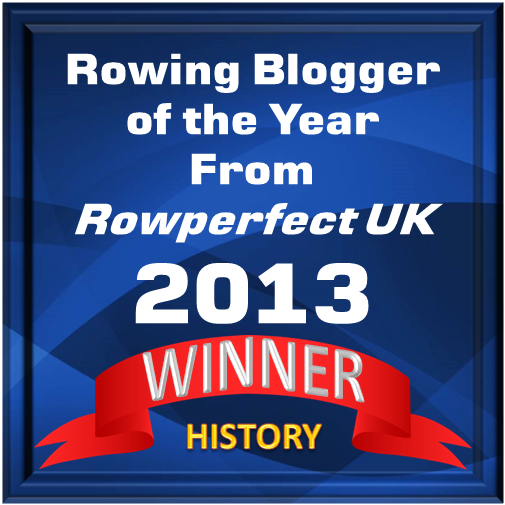 He added: ‘That day, after looking in the mirror, I decided to start rowing again. I began to take part in competitions for people in my age group, training six mornings a week – usually at 7 a.m. as I’d see my first patient at 8.30. I plodded along quite happily with this routine, even after retiring at 75.’ When Eugster retired from his dental practise, he moved to Switzerland. Charles Eugster after an outing in a double scull, where his rowing partner was a 15-year-old boy. After being physically active again at a high age, Eugster went on a mission to change the way society thinks about growing old. He became a public speaker and fitness blogger. Earlier in January, he published the book Age is Just a Number: What a 97 year old record breaker can teach us about growing old. Read more about his book on his website, here. In interviews and speeches, Eugster confessed that to stay fit and be in shape a certain vanity always helps. At 90, he still wanted a beach body to ‘turn the heads of the 70-year-old girls on the beach’. The following video, which has been viewed more than 600,000 times on YouTube, shows an aspiring talk that Charles Eugster, witty as ever, held at an TEDxZurich event in Switzerland. So, ‘old age’ is no longer an excuse to not exercise. Personally, I need to get in better shape. The way I look now, not even ‘70-year-old girls’ will turn their heads on the beach. I think that Charles Eugster has showed me the way. Charles never got beyond the first round at Henley but he had some significant wins in 1939. In late May 1939, with war (as it turned out) only three months away, Charles was in a Thames eight that beat German, French and Belgian crews at the Ostend International Regatta in Belgium. Thames was two lengths down after 1500 metres but went through the Germans in the last 500 to win by a canvas. A defeat for the crew from Nazi Germany that had been expected to win delighted not only Thames but all the other competitors and it was later said that ‘no win could have been more popular and the crew was feted right royally’. Seventy-three years later, Charles recalled the race in a wonderful speech to the Thames Annual Dinner. Fortunately, somebody recorded it an put parts of it on YouTube https://www.youtube.com/watch?v=8ZlwCzn_sbU (at 2 minutes 25 seconds, Charles begins to Hear The Boat Sing). The 1939 season ended well for Charles as he was in TRC crews that won both Championship Fours and Championship Eights at the prestigious Metropolitan Regatta at Putney. ‘There was nothing genetically special about Charles. His understanding of the ageing process, and the lifestyle he adopted to ensure his ongoing physical and mental well-being, is something everyone can aspire to. He passionately believed that continuing physical and mental activity into the later years of life provides incalculable benefits to individuals and to society as a whole. Charles never sought physical immortality but he wanted to ‘change the world’ to make advanced old age a different experience… one that could be exciting, useful and fulfilling. At this, he led by example and magnificently over-achieved until the very end of his remarkable life. His legacy, however, will live on having inspired thousands around the world’. ‘If I had known that I was going to live this long, I would have taken better care of myself’ is a witticism that has been attributed to many people. Given current life expectancies, it is also something that many of us may be uttering in the future. Charles was definitely the most inspiring person I ever! You are never too old for anything and there is no limit. Charles was so inspirational in his book ‘age is just a number’ anyone around 65, when society persuades you that you are old should read it-you will start all over again and rebuild your body, mind and spirit. I am saddened in July 2018 to read that he died at 97 last year but his memory will live on and always motivate me personally and many others I hope to feel born again, alive and fit for as long as possible. Rest in peace Charles… 🌟. I’ve started rowing at age 77.